May 15, 2017 — Links International Journal of Socialist Renewal / John Riddell's Marxist Essays and Commentary website — One hundred years ago, on May 15 (2), 1917, the Executive Committee of the Petrograd Soviet of Workers’ and Soldiers’ Deputies issued two appeals – one to all socialists of the world and the other to all soldiers at the front. In the days leading up to the appeals, liberal figures in the Provisional Government had talked with moderate socialist leaders of the Soviet about forming a centrist and more broadly representative government. Radical socialists opposed this effort. Nevertheless, with moderates holding a majority in the Soviet, some of them consented on May 14 (1) to join the Provisional Government to prevent a looming political crisis. The new government comprising six socialists and ten non-socialists was announced on May 18 (5). Despite being called a “coalition,” the new government did not function harmoniously, for significant differences remained between socialists and liberals over social and economic reform. The May 15 (2) appeals from the Soviet reflect the new relationship between it and the Provisional Government. Selection, translation and annotation by Barbara Allen. To Socialists of all countries. The Russian Revolution was born in the flames of world war. This war is a monstrous crime committed by imperialists of all countries. Their greed for conquest and their insane arms race prepare for worldwide conflagration and make it inevitable. No matter who will win militarily, the imperialists of all countries share victory in this war, which has monstrously profited them. They are amassing colossal capital in their hands, which is the reason for their unprecedented power over individual lives and labor. But for the exact same reason, laborers of all countries are this war’s losers. Countless victims are sacrificed on the altar of imperialism, where they lose their lives, their health, their fortune, and their freedom. They carry the burden of unspeakable deprivations. The Russian Revolution, which is a revolution of laboring people – workers and soldiers – is an uprising not only against tsarism, but also against the horrors of worldwide slaughter. This is the first indignant cry by a detachment of the international army of labor against the crimes of international imperialism. This is not only national revolution, but also the first stage of international revolution, which will end the disgrace of war and return peace to humanity. From the very moment of its birth, the Russian Revolution distinctly recognized the international task confronting it. Its authoritative body – the Petrograd Soviet of Workers’ and Soldiers’ Deputies – in its appeal of March 27 (14) summoned all peoples of the world to unite in the struggle for peace. The revolutionary democratic forces of Russia do not want a separate peace, which would free the hands of the Austro-German alliance. They know that a separate peace would betray the cause of worker democracy in all countries. The forces of worker democracy would be bound hand and foot before the world of victorious imperialism. They know that a separate peace could lead to the military defeat of other countries. This result would for many years fortify the victory of chauvinism and revenge in Europe, which would remain an armed camp, as it was after the Franco-Prussian War of 1870. A new bloody fight would soon become inevitable. Russia’s revolutionary democratic forces want universal peace on conditions acceptable to laborers of all countries. They do not strive for annexations or plunder. Instead, they want all peoples to freely express their will and they want to reduce the power of international imperialism. Lacking ulterior motives and acting with proletarian intellect and emotion, they have adopted the formula of peace without annexations and indemnities based on the self-determination of peoples. It provides the central platform on which laborers of all countries, both combatant and neutral, can come together to establish enduring peace and to heal the wounds dealt by bloody war. The Provisional Government of revolutionary Russia adopted this platform, and the revolutionary democratic forces of Russia appeal first to you, the socialists of allied powers. You should not allow the voice of the Russian Provisional Government to remain alone among the Allied powers. You should force your governments to declare decisively and definitively that they share the platform of peace without annexations and indemnities, based on self-determination of peoples. In this way, you will attach proper gravity and force to the act of the Russian government. You will give confidence to our revolutionary army, which carries on its banners the slogan ‘Peace among peoples’, that its wounded and fallen will not be used for evil purposes. You will make it possible for it to fulfill its entire allotted share of fighting tasks with all of its revolutionary enthusiasm. You will strengthen its faith that by defending revolutionary advances and our freedom, it simultaneously struggles for the interests of all international democratic forces and makes the desired peace come more quickly. You will also confront the governments of warring countries with the need either to decisively and irrevocably reject the policy of conquest, plunder, and violence, or to openly recognize their crimes, and so rain down upon their heads the righteous anger of their peoples. To you socialists of the Austro-German alliance, the revolutionary democratic forces of Russia appeal not to allow your governments’ military forces to act as the executioners of Russian freedom. The revolutionary Russian army has been enveloped by a joyous mood of freedom and brotherhood. You must not permit your governments to transfer troops to the Western front to destroy France, then attack Russia, and finally suffocate you and the rest of the international proletariat in the global chokehold of imperialism. The revolutionary democratic forces of Russia appeal to socialists of combatant and neutral countries to prevent the triumph of imperialism. Let the efforts of the international proletariat bring the campaign for peace, which the Russian Revolution began, to a successful conclusion. To unify these efforts, the Petrograd Soviet of Workers and Soldiers’ Deputies decided to assume the initiative to convene an international conference of all socialist parties and currents of all countries. No matter what disagreements have split socialism during three years of war, no current of the proletariat should refuse to participate in the joint struggle for peace, which has been put on the agenda of the Russian Revolution. We are confident, comrades, that we will see representatives of all socialist groups at the conference we have convened. The unanimous decision of the proletarian International will be the first victory of laborers over the international of imperialists. Published in A.G. Shliapnikov, Semnadtsatyi god, volume 4, 1931, pp. 25-26. Comrade soldiers at the front! On behalf of the revolutionary democratic forces of Russia, we ardently appeal to you. Yours is a difficult fate. By the dear price of your blood, you paid for the crimes of the tsar who sent you to fight and who left you without weapons, bullets, and bread. Indeed, the tsar and his stooges bear responsibility for the deprivations that you are now suffering, for they have allowed the country to rot and become exhausted. The revolution will require much more effort to overcome the devastation, which it inherited from the robbers and butchers. The laboring people did not need war and they did not start it. Rulers and capitalists of all countries brought it about. For the people, each day of war is an extra woe. 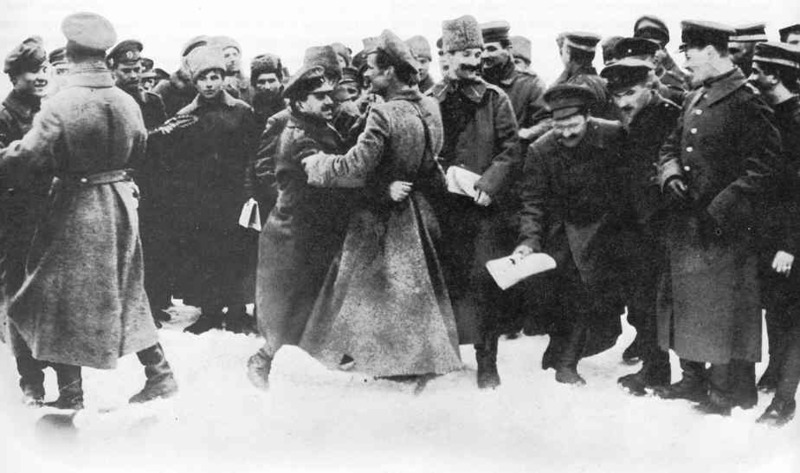 Having toppled the tsar from the throne, the Russian people made its first task to end the war as quickly as possible. The Soviet of Workers’ and Soldiers’ Deputies appealed to all peoples to end the war. It appealed to the French, the Germans, and the Austrians. Russia awaits an answer to this appeal. But remember, comrade soldiers, our appeal will not be worth anything, if [Kaiser] Wilhelm’s regiments defeat revolutionary Russia before our brothers – the workers and peasants of other countries – respond. Our appeal will be worthless unless it is supported by the entire power of the revolutionary people and if Wilhelm Hohenzollern secures his triumph over the ruins of Russian freedom. Free Russia’s downfall will be an enormous, irreparable misfortune not only for us, but also for the laborers of the entire world. Comrade soldiers! Defend revolutionary Russia with all your strength! Workers and peasants of Russia strive toward peace with all their heart. But it should be a universal peace for all peoples by their general agreement. What will happen if we want a separate peace only for ourselves? What will happen if the Russian armed forces drive their bayonets into the ground today and say that they do not want to fight any more, that what goes on in the rest of the world is none of their business? What will happen is that German imperialism, having defeated our allies in the West, will fall upon us with all the strength of its weaponry. What will happen is that the German emperor, landowners, and capitalists will place their heavy heel upon our necks, will seize our towns, villages, and land, and will impose the yoke of tribute upon the Russian people. Really, did we cast off the yoke of Nicholas, in order to bow down before Wilhelm? Comrade soldiers! The Soviet of Workers’ and Soldiers’ Deputies leads you to peace along a different path. We lead you to peace by calling for an uprising, for a revolution by the workers and peasants of Germany and Austro-Hungary. We lead you to peace by winning from our government a rejection of the policy of aggression and by demanding the same rejection from the allied powers. We lead you to peace by convening an international congress of socialists of the entire world for a joint, decisive uprising against war. Comrade soldiers, it is time for the peoples of all countries to wake up. It is time for them to arise and with an iron hand force their kings and capitalists to move toward peace. It is time for laborers of all countries to close ranks with us in a merciless struggle against aggressors and robbers. But you remember, comrade soldiers. This time will never arrive if you fail to hold back the enemy’s onslaught at the front, if your ranks are crushed, and if the lifeless corpse of Russian Revolution lies at Wilhelm’s feet. Remember, comrades. You now stand guard for Russian freedom at the front in the trenches. You defend the Russian Revolution. You defend your brothers, the workers and peasants. Let this defense be worthy of the great cause and of the great sacrifices already imposed on you! No matter what, you can’t defend the front by sitting still in the trenches. The enemy’s attack can only be prevented by going on the offensive. To wait for attack one more time means to await death submissively. Only by going onto the offensive is it possible to save yourselves and your brothers on other sectors of the front from death and ruin. Remember this, comrade soldiers. Having vowed to defend Russian freedom, don’t reject the coming actions which military circumstances demand. Russia’s freedom and fortune are in your hands. Beware of traps and provocations while you are defending this freedom. The fraternization which is developing at the front can easily become a trap. With whom may revolutionary forces fraternize? They may fraternize with another revolutionary army, which has resolved to die for peace and freedom. But the German and Austrian armies are not yet revolutionary, no matter how many ideologically conscious and honest individuals are in them. They still have no revolution there. The military forces there still follow the emperors Wilhelm [of Germany] and Karl [of Austria-Hungary], the gentry landowners, and the capitalists. They support seizure of other people’s land, plunder, and violence. Their military high command exploits not only your trust but also the blind obedience of its own soldiers. You fraternize sincerely, yet you are met with an officer of the general staff who emerges from the enemy trenches disguised in a soldier’s uniform. You speak with the opponent without any cunning. Meanwhile, his commander photographs the terrain. You cease fire to fraternize, yet during this time the enemy moves artillery, constructs fortifications, and transfers forces behind its trenches. Comrade soldiers! You will not achieve peace through fraternization, nor with tacit agreements concluded at the front by individual companies, battalions, and regiments. The salvation of the revolution and the triumph of peace across the world do not lie in a separate peace or in a separate truce. People who assure you that fraternization is the path to peace are leading you to your death and to the death of Russian freedom. Don’t believe them. There is a different road to peace. The Soviet of Workers’ and Soldiers’ Deputies pointed it out to you. Support it. Sweep away everything that weakens your military strength and that brings demoralization into the army. Your military strength serves the cause of peace. The Soviet of Workers’ and Soldiers’ Deputies can only struggle for revolution and peace if you prevent Russia’s military rout. Comrade soldiers! The workers and peasants not only of Russia, but of the entire world, put their trust and hope in you. Soldiers of the revolution, be worthy of this trust, knowing that your fighting serves the cause of peace. Carry out your military duty with unwavering resolution, in the name of revolutionary Russia’s happiness and freedom and the future brotherhood of peoples! Published in A.G. Shliapnikov, Semnadtsatyi god, volume 4, 1931, pp. 26-28. Rex A. Wade, The Russian Revolution, 1917 (Cambridge University Press, 2000), pp. 85-86.